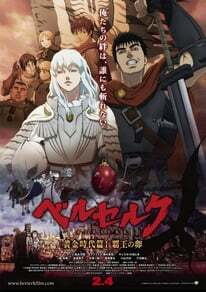 Nearly fifteen years after the Berserk television anime, Kentaro Miura's manga series has received a new anime adaptation in the first in a trilogy of films, Berserk Ōgon Jidai-Hen I: Haō no Tamago (Berserk Golden Age Arc I: Egg of the Supreme Ruler), helmed by director Toshiyuki Kubooka (Batman: Gotham Knight episode 5) and animated by Studio 4°C. While the story is abbreviated at some points, the film is very faithful to Miura's manga, covering the material that appears from roughly midway into volume 4 to midway into volume 6 of the original. This concise and well-adapted story results in an exciting, intense action tale full of intriguing characters and drama. Unfortunately, the decision to heavily utilize 3D CG throughout the movie drags the overall production down, but does not quite deal a fatal blow to the film, which despite this shortcoming should find a receptive audience from fans of the series and newcomers alike. Berserk wastes no time introducing viewers to its world, beginning in the middle of a gruesome battle that establishes Guts as the powerful protagonist of the series, then quickly introducing Griffith, the other male lead in the movie, in another action sequence. While the film is full of action scenes both large and small in scale, many of them also serve to flesh out the differing personalities of the lead men who have devoted their lives to battle. In fact, one of the biggest driving forces behind the entire film is the relationship between Guts and Griffith, as well as Casca, the only woman in Griffith's Band of the Hawk army. The relationship between these three is treated with subtlety and respect, especially the dynamic between Guts and Griffith, which captivatingly fluctuates between rivalry, friendship, and romance. The film revolves around the desires and ambitions of both men, giving viewers room to analyze and consider each of the decisions they make and where fate may take each of them. The concept of fate is a major one throughout the series, rearing its head throughout the film in both characters' actions, as well as in moments of intense but not heavy-handed foreshadowing, both of which give the series the sense of being a grand, large-scale story. While viewers familiar with the content of the three volumes of Berserk that precede the story in the film will probably have a deeper understanding and connection to Guts and Griffith's actions, the story is by no means impenetrable to first-time viewers. Casca is also a major player in the film, fortunately avoiding being treated as a throwaway female side character by showing her own strengths while holding complex emotions about both lead men. Overall, the film's mix of strongly-directed character interaction and battle sequences makes for a very well-paced film, ending before you know it on an exciting note that leaves viewers hungry to find out what happens next. Despite these many positives, though, the visual presentation of Berserk works to detract greatly from the film as a whole. In order to depict large-scale battle scenes with scores of armored soldiers, among other things, Studio 4°C has opted to use 3D CG animation throughout the entire film. Of course, there are advantages to this approach, as it allows them to depict these large-scale battles from the birds-eye view that is a hallmark in the Berserk manga, while also allowing for wild camera movement and tricks similar to those seen in big-budget action movies that would be prohibitively expensive for a production of this size. However, the execution of this style can be quite distracting, sometimes jarringly so. Possibly in order to make the film's CG look closer to the limited animation style of Japanese anime, the frame rate of the 3D animation is often lowered significantly, which many times only has the effect of making the characters look stilted and unnatural. Other times, character movement may look mechanical or clearly motion-captured, which along with the sometimes-uneven modeling can result in action scenes that look like Playstation 2 in-game cinematics or tech demonstrations. While the previously-mentioned positives to this style manage to salvage the film's action sequences to some effect, these problems result in it being incredibly difficult for viewers to make vital emotional connections to characters so long as we see them primarily depicted in this way. Perhaps realizing this, the wise decision was made to merge 3D models with traditional 2D animation in various places, particularly in closeups of character faces. Many of the slower-paced scenes where this technique is used are nearly indistinguishable from traditional 2D animation, making them seem far more natural than any other scenes. This thankfully makes it easier to emotionally connect to the characters after enough time is spent with them in close-ups, eventually drawing viewers into the superb character drama. Nevertheless, the constant distraction and distancing effect that the 3D has on viewers detracts from the film in a large way. Beyond these visual flaws, Berserk does feature very strong voice acting, with its impeccably-cast lead trio all turning in believable performances that do an excellent job of drawing you into the story. The soundtrack is also well done, with a fittingly grand and cinematic orchestral score by Shiro Sagisu (Evangelion series, Bleach series) performed by the London Studio Orchestra driving along the fantasy story, while the film's theme song by Susumu Hirasawa (Berserk TV, Paprika) takes the soundtrack's characteristics and motifs and intensifies them in a piece that is immediately recognizable by anyone familiar with Hirasawa's work. With all of this in mind, it is not easy to come to a definitive conclusion regarding this film. While Studio 4°C is often considered a creative environment open to experimentation and risk-taking, risks do not always pay off, and that is certainly the case here, as the studio's 3D gambit ends up having a significantly negative effect on what is otherwise an excellent product. While some of these kinks may, with luck, be worked out by the time the remaining installments in the film series are released, as it is, Berserk Ōgon Jidai-Hen I: Haō no Tamago must be a film that bears a caveat despite all of its admirable traits. + Captivating story and characters, traditional animation problem-free when used. − Awkward 3DCG can distract viewers, acting as a potential barrier to enjoy these positives.